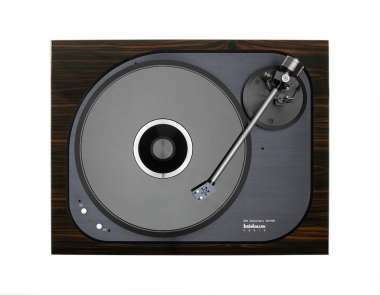 The most prominent feature of the »Oasis« turntable is most probably its direct drive mechanism. In our never-ending search to improve sound quality, we did not stop short of evaluating different drive mechanisms or other alternatives such as belts of various consistencies. We quickly discovered, however, that belts, for example, impart a fundamental sonic characteristic on the sound. We therefore decided to forgo them altogether for this new model. As it turns out, the platter of the »Oasis« is driven directly instead of with a belt. The drive mechanism consists of a ring shaped permanent magnet contained in the platter's bearing and four air-cored inductors on the »Oasis's« chassis plate. These inductors are adjusted and driven with utmost precision to different phase angles. Thus, the ensuing magnetic field rotates the platter. Well aware of the reason for the bad reputation and uneasy sound of the direct drive turntables of the 1970s and 1980s, we resisted tight regulation of the direct drive mechanism. Instead, we take advantage of the many years of experience and insight we gained from manufacturing our own “big” turntables. We use a precision bearing that is capable of smoothing out the drive's miniscule speed variations. This results in a rotational smoothness hitherto unimaginable with “classic” direct drive mechanisms. Our clamping mechanism allows for quick and precise adjustments, without any play, of the aluminum arm base for 9 to 10.5-inch length tonearms. The platter is made of a special resonance-inhibiting alloy of aluminum, copper, magnesium and other materials. A crystal glass platter top layer and a screw-down record clamp allowany vibrations to be quickly absorbed by the platter. Finally, three height adjustable spikes allow for a precise leveling and optimal contact of the turntable to your choice of platforms (although we recommend HRS' M3 Isolation Base). 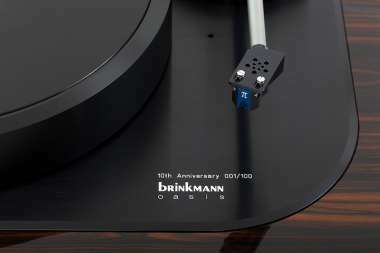 Introduced in 2007, Oasis was Brinkmann’s first Direct Drive Turntable, as well as the first Brinkmann to use the proprietary “Sinus” motor technology. Our “10th Anniversary Final Edition” Oasis includes a 10.5 Tonearm and features an improved direct drive bearing. These will be the final 100 Oasis we will build. easy and quick exchange and adjustments are provided via a collar system.